Perfectly Created Chaos! : SCS sketch Challenge. Where would I be without sketch challenges?! Mmm...probably not stamping, that's for sure! I think the thing I love the most about them is 75% of the thinking is already done for me! This is my card for yesterday's SCS sketch challenge. I found a scrap of the DSP in my folder and built the card around that. The base of the card is actually Celery. I got the DSP a little close to the edge on the right side, so it's a bit hard to see in the picture. This was also the first time I got to use my new Nestabilities! Yes, I finally have a way to cut ovals! Yippee!! This is from the petite oval set. Everything else about the card is really straight forward. I spent most of the day yesterday reloading songs onto my iPod, so I'm off to be creative. Speaking of music, have you all seen this video on You Tube? K Werner posted it yesterday and I love it!! This is very pretty! I love the mixture of patterned paper. The buttons are the perfect 'something extra'! I know what you mean about sketch challenges! Sometimes when I can't get started on a card, these really help my mojo! I love the DSP you used! Great card and nice video! Very cute card! I like the images you used. Great job on the piercing too. TFS! Fab card and I like the sketch! tfs!!! 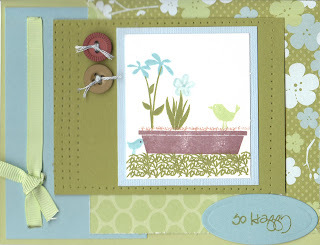 Love the delicate colors of your beautiful card!! Wonderful work! I just heard this song performed 4 times at an elementary school talent show!! What a joy to hear this amazing rendition - gorgeous and flawless!! TSMFS! beautiful card, love the piercing. Doesn't anybody want my candy!! One for the Little Girls! A Milestone and Some Candy!! Mojo Monday with a New Technique. One card for a Busy Day!